Sri Lanka batsman Danushka Gunathilaka has been suspended from all forms of international cricket by SLC for breaching the ‘Player Code of Conduct’, pending inquiry. The board will also withhold Gunathilaka’s match fee for the ongoing Test against South Africa, in addition to the suspension that will come into effect immediately after the match at SSC. 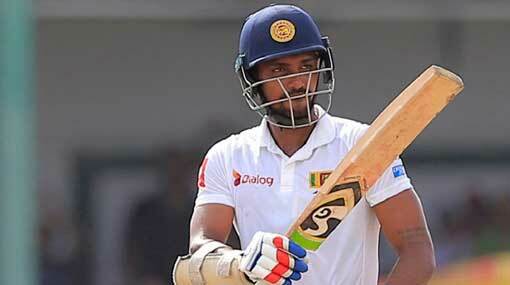 Gunathilaka has had a sequence of disciplinary issues in the recent past. In January this year, he had been officially reprimanded for breaching Level 1 of the ICC Code of Conduct during the final of the T20 tri-series against Bangladesh. He had been reprimanded for giving Tamim Iqbal a send-off when the batsman was on his way to the dressing room. As a result, one demerit point had been added to his disciplinary records. Last year, Gunathilaka had been suspended for six white-ball matches for misconduct, and was hence omitted from the ODI squad for the series against Pakistan in the UAE. ESPNcricinfo had reported that Gunathilaka missed a training session, turned up to a match without his gear, and was generally found to have had an indifferent attitude towards training - all during Sri Lanka’s home series against India. The suspension was later revised to three matches, the remaining three matches being part of a suspended sentence over a one-year period, which could come into force in the event of any further disciplinary breaches. He had also been fined 20% of his annual contract fee.